​No matter where you are from, when we think of boom towns, we think of Tombstone. Is it the history or is it Hollywood that brings Tombstone to mind of so many people from all over the country, even the world? This is about another boom town most people have never heard of, a town not “too tough to die”. While the city made a lot history it never made the movies, which is too bad because it’s a great American story about the birth of our biggest industry. Not silver or gold, no this was an oil boom town. While it would only survive for less than two years, its population would grow to almost 20,000. The town got its start in May of 1885 and about 500 days later, early 1867, it was up for sale. In the space of that time it would be incorporated, build a few churches, a red light district, some 54 hotels, a railroad, a post office, newspapers, a 1,100 seat theater, saloons, restaurants, oil refinery, and the world’s first oil pipeline. Destructive Fire at Pithole City. A disastrous fire occurred at Pithole yesterday morning about 2 o'clock. The fire originated on First street, near the Florence restaurant, and extended rapidly in both directions, destroying some fifteen or twenty buildings. The Record says all the buildings on both sides of First street between Brown and Pather streets, are destroyed. Within a few doors of the Continental Hotel a building was torn down, which prevented it reaching the former. The rain of last night was a godsend to this place, for had the buildings had been dry no efforts could have saved the city from destructions. The loss must be somewhere in the neighborhood of $25,000. The following is a partial list of the buildings destroyed: The Venango Saloon, Florence Restaurant, Hogan's Lager Beer Saloon, Ice Cream Saloon; Washington Restaurant; Dutch John's Lager Beer Saloon; Hill's Restaurant and the Blacksmith Shop near the Galt House. We hear, but trust the rumor is not correct that two children were burned in one of the buildings. It is suspected that the fire was the work of an incendiary. As the oil ran out so did the people and by January, 1866 the population was down to about 4,ooo. In February, 1867 another fire destroyed most of the remaining buildings and by 1870 just a few hundred folks were left. The area is rich in oil history with oil creek, oil city, and Titusville site of the first drilled oil well and birth place of the oil industry. 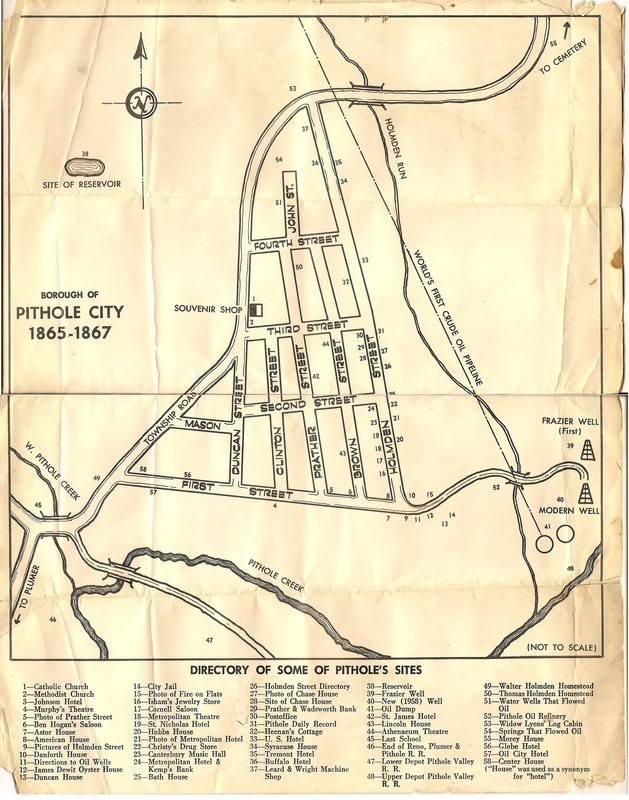 While it’s worth the time to visit there isn’t anything left of Pithole City, a visitor center has great displays and artifacts and the towns streets are laid out. And yes you can buy that tee shirt or coffee mug after walking the town (field). 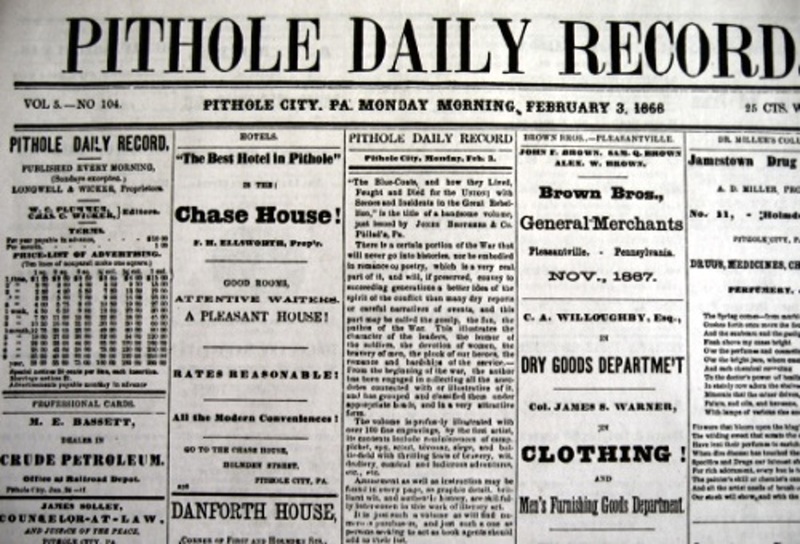 Pithole is also listed in the National Register of Historic Places. So is it the history or is it Hollywood’s movies that make a historic place jump to mind? If you haven’t heard of Pithole City before, you know the answer.